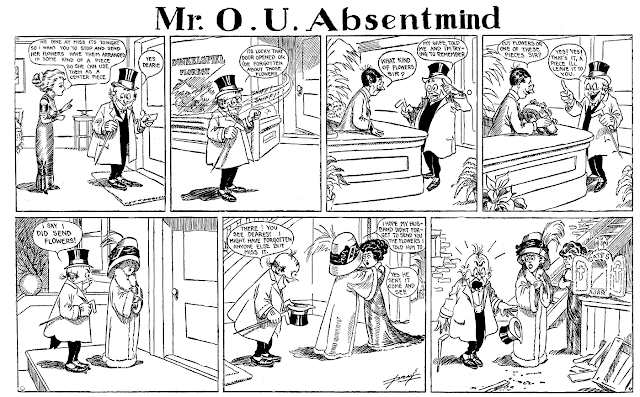 November 7 1909 -- Another Baron Mooch strip that didn't make it into the Blackbeard book. I got a kick out of the vendor's prices increasing as the cop and the 'cop' help themselves to freebies. 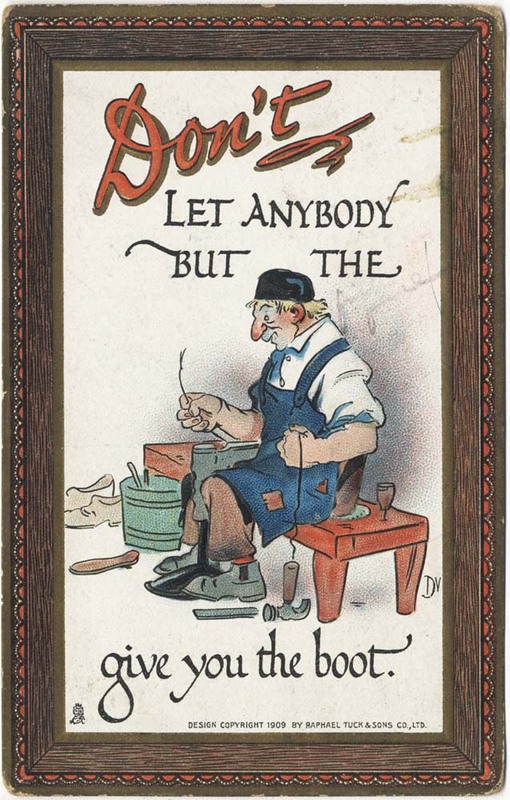 Here's a Dwig card from Tuck's Series #165 ("Knocks Witty and Wise"). Bertha L. Corbett was born on February 8, 1872, in Denver, Colorado according to Woman’s Who’s Who of America (1914). Bertha’s father, Waldo, was listed in the Corbett, Hoye and Co.’s Annual City Directory City of Denver from 1876 to 1879. In the book History of Arkansas Valley Colorado 1881, Mr. Corbett was mentioned as a member of the Knights of Honor in Leadville, Colorado. Sometime later, the family moved to Minnesota. In the 1895 Minnesota State Census, Bertha was the oldest of three siblings. Her mother’s name was the initials C.E. The family lived in Minneapolis. The American Art Annual (1915) said Bertha studied with Douglas Volk at the Minneapolis School of Fine Arts, and Howard Pyle at Drexel Institute. According to the 1900 United States Federal Census, the family lived in Minneapolis at 3404 Chicago Avenue. Her mother had died between the state and federal censuses; her father was a sign painter. 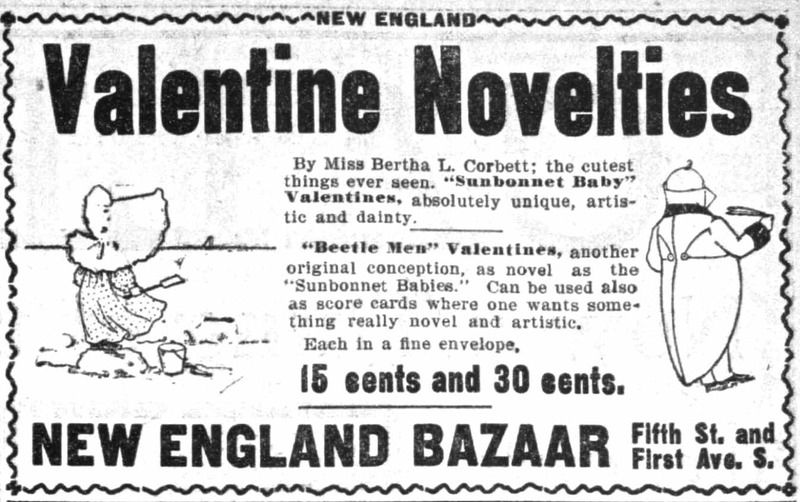 The Minneapolis Journal (Minnesota) published an New England Bazaar ad, on February 6, 1901, which featured Sunbonnet Baby Valentines. ...The Sunbonnet Babies really grew out of a group of children I saw playing in the sand. I drew a picture, the original Sunbonnet Baby, as it afterward proved. My fellow artists examined it critically and professed to like it. I fell quite in love with it myself and at once set to work to draw more…. …They came out in a book bearing their names in June 189[illegible] accompanied by little verses of explanation. Then the dainty maidens began to appear on blotters, valentines, Christmas cards and calendars, and now they are coming out in a primer, which Rand & McNally will publish soon. …[Bertha] told of a visit to the theatre with a friend who, after watching her sketch this and that actor's face, remarked: “It is all in the face, isn’t it? There would be no expression or meaning in a picture if you left out the face?” Miss Corbett after a moment's thought sketched for her a little child tugging his wagon loaded with autumn leaves in which no face appeared and yet the picture told its story. From that time the idea grew and the little sunbonnet people have grown and developed as healthy children will, until the oldest are 4 years of age. Miss Corbett has collected a number of her earlier children late a little volume which has been published. She is now working on a Sunbonnet Baby Primer for Rand & McNally of Chicago, the text for which is being written by Miss Eulalie Grover…. A book which won the heart of all was the Sunbonnet Children with four leaved cloves over their shoulders, which Miss Corbett got out about Christmas time, four years ago…. The Inland Printer, March 1901, printed several Sunbonnet Baby drawings and Bertha’s letter. 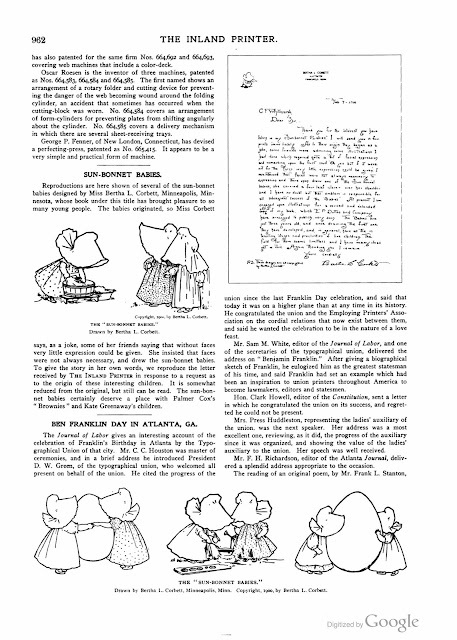 The Sunbonnet Babies’ Book was published in 1902. Bertha’s Chicago studio was mentioned in the Minneapolis Journal on October 22, 1905. Miss Corbett has an attractive studio in the Fine Arts building with some other young women in art crafts, but she uses the place now rather as business headquarters than as a workshop, for her work has taken an entirely new turn and now the babies and boys are being exhibited in chalk talks by their creator. The Sunbonnet Babies made a great hit when the Sunday World gave them as illustrations of a series of art lessons to New York City readers. It has now been decided to give the set to out-of-town readers. 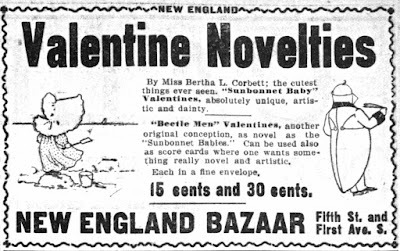 Perhaps the Evening World’s sunbonnet series prompted Corbett to develop her comic strip, The Sunbonnet Babies, which debuted in the Boston Globe on December 8, 1907. The series ended June 28, 1908. According to Woman’s Who’s Who, Bertha was a member of the Chicago Woman’s Press Club, from 1907 to 1909, and a member of the California Woman’s Press Club beginning in 1909. 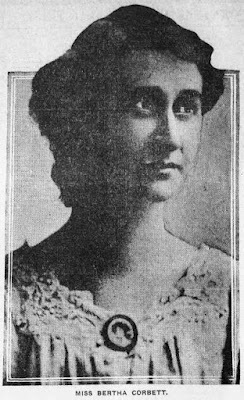 The Los Angeles Herald, January 2, 1908, reported Bertha’s visit while on her way to Japan. Bertha was counted twice in the 1910 census. She was a roomer in Chicago at 4541 Prairie Avenue; her occupation was artist at a studio. And she was counted as a member of her father’s household in Minneapolis at 203 14th Street. Woman’s Who’s Who said she married artist George Henry Melcher in Los Angeles, California on August 5, 1910. Out West, November–December 1913, published Bertha’s “A Few Chicken-Feathers”. The American Art Annuals of 1915 and 1917 said Bertha was a resident of Topanga, California. 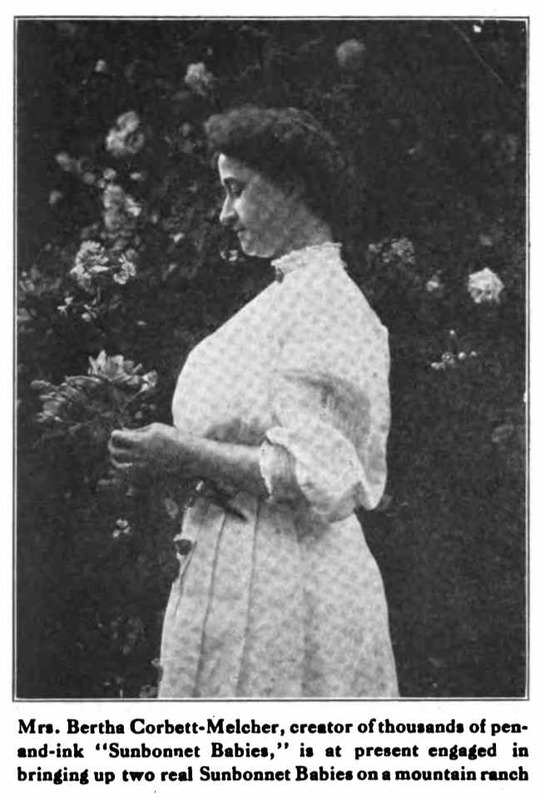 Bertha was profiled and photographed in the May 1917 issue of Sunset. Musical Courier, August 26, 1920, announced Bertha and her husband were members of the Nordskog Studios faculty. Social Progress, April 1922, published Bertha’s illustration for “How the Rabbit Got His Long Ears”. In 1920 Bertha, her husband and two daughters lived in Calabasas, California. The husband and wife were artists at a studio. The family remained in Calabasas in the 1930 census; George was an artist and Bertha was an illustrator, both independent. According to the 1940 census, Bertha was divorced and residing at 365 Norwich Drive in Beverly Hills, California, the home of her daughter, Ruth, who was married to C.J. and had two daughters. The California Death Index, at Ancestry.com, said Bertha passed away June 8, 1950 in Los Angeles. Woman’s Who’s Who said Bertha’s recreation was horseback riding and she favored woman’s suffrage. When Don Wooton was working for the Cleveland Plain Dealer he began producing a Sunday feature titled The Week on Parade in the early 30s. This feature is beyond our purview here at Stripper's Guide since it was a cartoon look at the week's news stories. I classify that as editorial cartooning and take a pass. However, on January 29 1933, Wooton renamed the feature Personalities on Parade and changed the focus to a combination of straight humor plus lampoons of local Cleveland personalities. That change puts Wootton's delightful work in our sights, for which we are very glad. The always restless Mr. Wootton, however, did not stick with the feature for long. 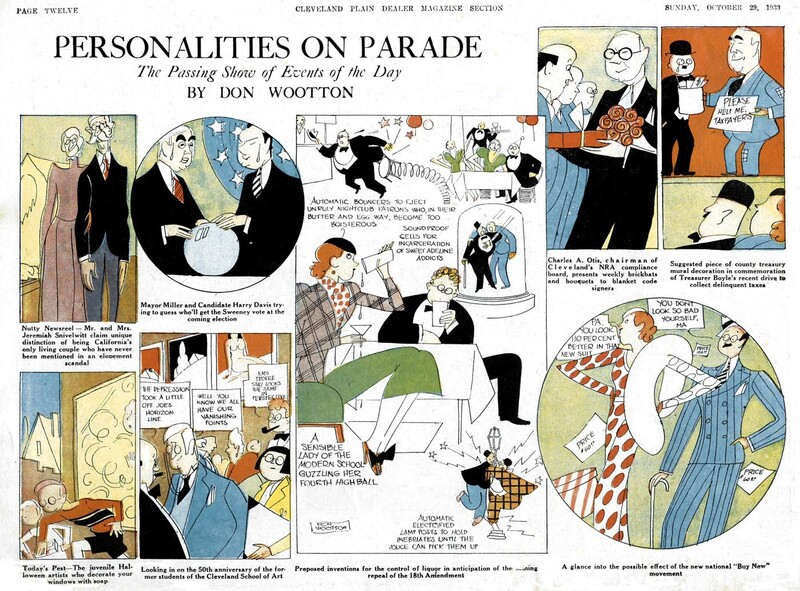 The weekly half-page color cartoon ran in the Plain Dealer's Sunday magazine section only until July 8 1934. 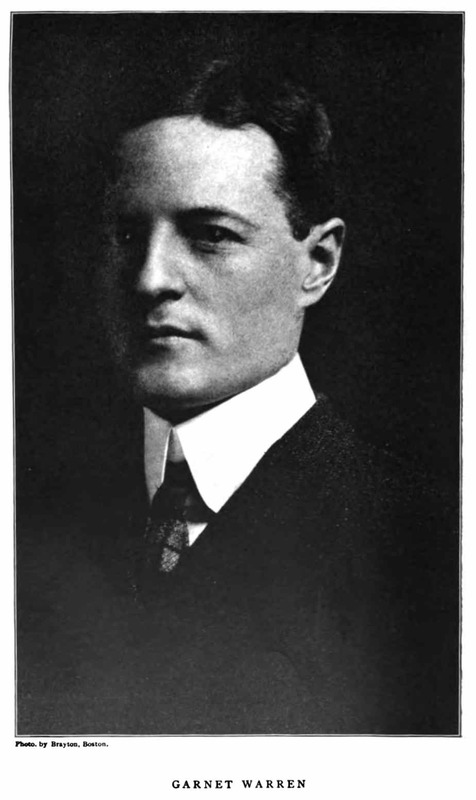 Before John R. Bray cemented his place in history as an animation pioneer, his previous success was pretty well limited to a stint on the well-received Sunday strip Little Johnny and the Teddy Bears. When that series ended in 1909 it seems that Mr. Bray used his pay to buy a small farm, and gave his occupation as farmer to a census-taker. Farming apparently wasn't immediately profitable, and to keep the bank account healthy he penned the series Mr. O.U. Absentmind for McClure starting on October 17 1909*. This series was obviously done purely for the paycheck. The absent-minded character had already been done to death in the early comic sections, and Bray offered us nothing unique in his take. The gags are shopworn when they do work, and often don't work at all. In the above sample, for instance, the florist has been given no direction to send a funeral wreath, so why would he? With two minutes of thought Bray could have straightened out the gag so that Mr. Absentmind gives the wrong impression to the florist -- because, ya know, he's absent-minded. The art on this feature is actually quite fine, but that's because Bray has swiped all his characters from William F. Marriner. Granted, that was a common bit of larceny in those days, but Bray had already shown that he could get along just fine in his own style. The dismal Mr. O.U. Absentmind lasted a long time in one of the secondary McClure sections, proving that the syndicate really didn't care much what they used to take up space. Readers were blissfully relieved of it after November 26 1911*, except when they ran an unused or reprint strip much later, on February 28 1915**. I reckon the gag here is that the florist has assumed Mr. Oh You might be interested in funeral weeds, and is showing him a sample, which is turned away from us, so the gag payoff is when we see just what sort of arrangement he was looking at. It would have been more effective if the shape of the first one matched the second, but I guess Bray might've been a bit absentminded. Or something. Here's another thing I just noticed about forgetting things. the (appears to be) tails of his jacket dangle out of the back of his coat only in panel five.If that's not what it is, maybe we should just ignore it. It's very interesting how many of the pioneer animators were influenced by Marriner's drawing style - Bray and Pat Sullivan being two notable examples. I would imagine that if Marriner had lived past 1914 he would have tried animation himself - his style correctly anticipated the american animation design style (like Swinnerton and post 1900 Opper).